The first two celestial objects to pop out at evening dusk are the waxing crescent moon and the dazzling planet Jupiter. The moon and Jupiter rank as the brightest and second brightest heavenly bodies in the evening sky, respectively. The position of the moon and Jupiter at evening dusk depends on where you live worldwide. Way up north – like in Alaska – the moon and Jupiter will appear rather low in southern sky at dusk. 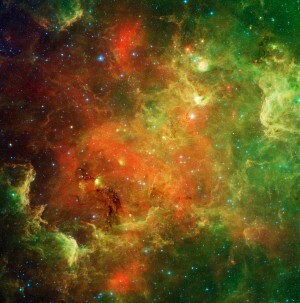 Farther south – like in the southern U.S. – they will first appear in the southwest sky. At the equator, the moon and Jupiter will pop out close to due west. At middle latitudes in the southern hemisphere, the evening couple will light up the west-northwest sky at dusk. As seen from all around the world tonight, Jupiter will set pretty much due west, at roughly 10:30 p.m. local time (11:30 p.m. local daylight saving time). Even though Jupiter sets at nearly the same hour worldwide, this world stays out much later after dark in the northern hemisphere. That is because the January sun sets so much earlier at more northerly latitudes, yet so much later at more southerly latitudes. 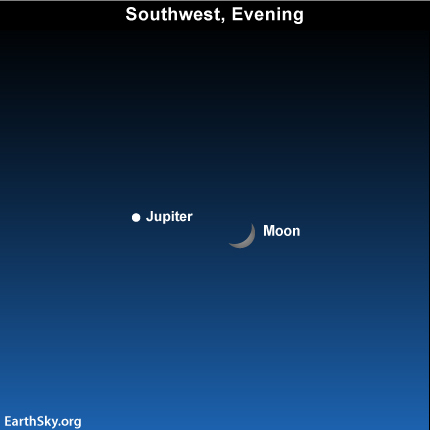 No matter where you live, however, look for the moon and Jupiter to adorn tonight’s evening sky! What is the bright object up before dawn in January? Site contents copyright © 2019 Recorder Online	except as noted. All rights reserved. | 88 queries in 2.083 seconds.